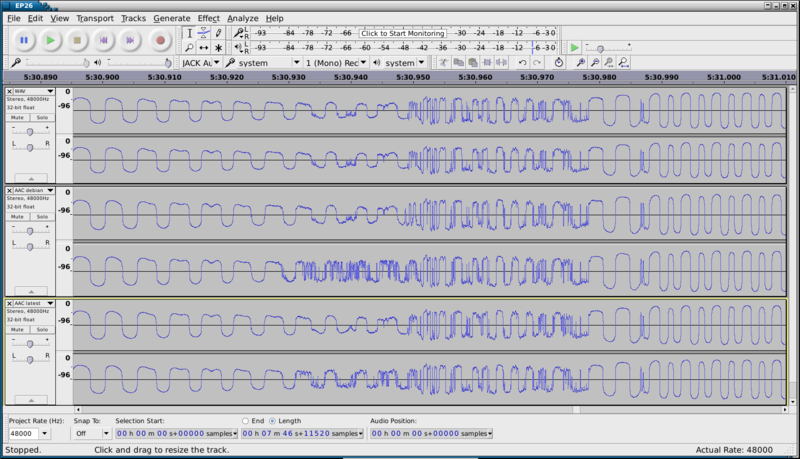 While converting a WAV file to AAC I noticed audible audio artifacts. Especially, the artifacts seem to appear on only one channel even in dual-mono. The issue has improved in the latest build compared to ffmpeg 3.2.12-1~deb9u1 used on our Debian 9.4 production host but is still clearly audible. A particularly audible artifact is present between 00:05:30.930 and 00:05:30.940 is the attached example file. I copied the audio files in extenso since the artifact seems to vanish when I trim the input file. Your input sample is completely silent between 5:30:930 and 5:30:940. What does the speaker say when you hear the artefacts? Hi @cehoyos. Thank you for your comment. Your input sample is completely silent between 5:30:930 and 5:30:940. If you use a visualization tool, you may need to look at the waveform using a log/dB scale instead of a linear one. The speaker saids "[...]Look at the Bluetooth hardware indi^cator you may see it blinks rapidly[...]", where ^ denotes the point where the artifact is audible. It's while the "I" sound is decaying, and just before the attack for the "CA" sound. In that latter case, there is undoubtedly some extra noise on the right channel. Actually, this is that asymmetry that makes me noticed it. Let me know if it was unclear.